As we say goodbye to the rich colours of October and hello to November with its paler palette, it’s clear autumn is here. I’m a person who loves all our seasons, the colours, the constant change and different gardening challenges they present. Living in a singular climate all year round, well, it’s just not me. But as we take one step closer to winter, it now becomes a race against time to get on with November’s tasks before the ground hardens and I’m giving myself a hernia trying to wrestle carrots out of the ground. So today on the plot, I laid some foundations for next year. Firstly, it was time to clear away the old tomato, chilli and pepper plants in the polytunnel. They were looking exhausted and had nothing else to give. So having harvested the last of them, I then set about clearing out and cleaning down. I know I’ve gone on about it, but the polytunnel has been a great investment this year, it’s already paid for itself. Not only has it helped me grow a bumper crop of vegetables, it’s a great place to propagate and sow seeds. Last year, I bought bare root wallflowers from an online company, and on arrival, I was bitterly disappointed with the state they were in. Although I cared for them, got them up to speed to produce some wonderful spring colour, this year I wanted to grow my own. So back at the height of summer, bathed in sunshine, wearing shorts and exposing my white knees to terrified onlookers, I sowed a batch of wallflowers ‘Fire King’ in trays and grew them in the polytunnel. Once they had produced a good root system, I planted them out temporarily into an unused part of the allotment and left them to grow tall and strong until needed. Well today was that day, and having cleared my flower borders around the allotment, I moved them to their final positions. And as I grow waves of daffodils in the same beds, I’m hoping that early next spring, my plot will be awash with colour. Allotments in the depths of winter can look desolate, so I’m hoping this splash of colour will lure the bugs and insects early in the year and offer them food, rest and recuperation on the darkest of days. And in return, these tenants will pollinate my growing crops. This weekend, I also dug over more beds and got on with some more prepping and green manuring. 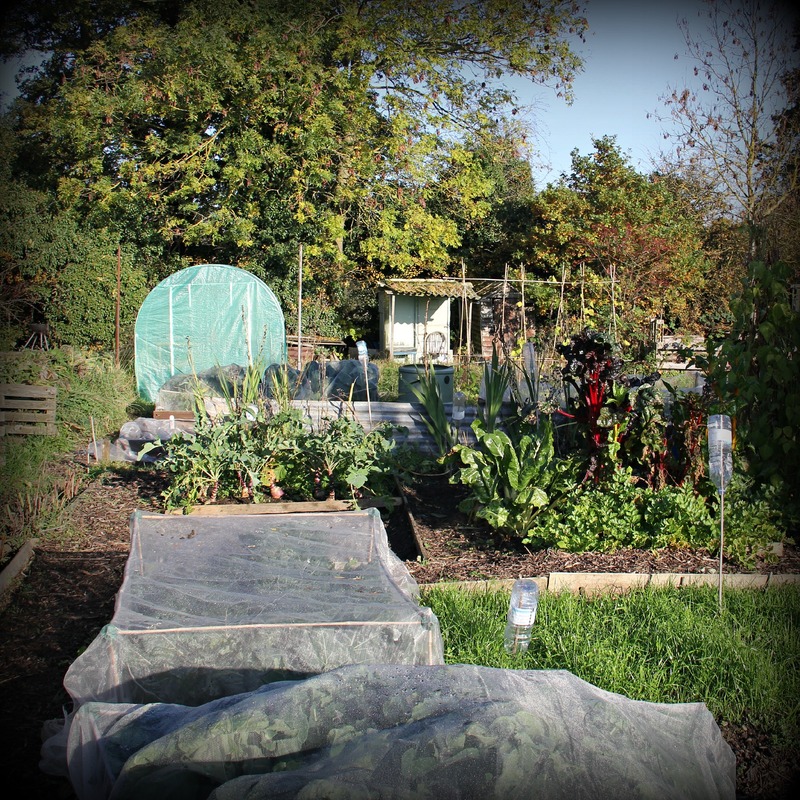 I know I’m in the minority up on the allotment when I do this, as the annual patchwork of tarpaulin and plastic sheeting has started to appear across the plots, but I’ve never been one to follow the trend. And anyway, I tried the plastic sheeting method the first year I had my plot, but I wasn’t happy with the results. It encouraged red ants to setup home there along with weeds with deep tap roots. But again that’s what gardening is all about: learning, trying, failing and (hopefully) succeeding. But always keep learning. It turned out to be a pretty good night! I got to dress up, terrorise my passing neighbours and best of all, Agent Soph and I had a Halloween buffet to celebrate the night with heaps of homemade beetroot marmalade.. Hmmm…. I am getting closer to buying a walk-in poly tunnel like the one in your pix. But I’ll wait till spring in case we have heavy snow this winter. Good plan! That’s what I did last year and I found when I was ready to buy one there were so many good deals to be had. It’s definitely worth the investment.